For those of you who love your shoes and fashion and are looking at the title of this post thinking who is she, I will state for the record that I do own more than 5 pairs of shoes. However, a) it’s winter, so that rules out wearing any form of summer shoe and b) I can’t walk in heels, which overall does limit the number of shoes I wear around this time of year. Anyway, stop rambling Megan, back to the point. On Monday morning, I was getting ready to go to my lecture and decided to wear my black patent brogues. I was just tying the lace when suddenly it snapped! This was when I realised that this pair of shoes was literally one of the only pairs I wear during winter, especially being in Leeds where it’s cold and icy. I’m not a shoe-obsessed kind of person. I would much rather a few good quality pairs of shoes that are comfortable, which go with a lot of outfits. Plus, on a student budget, shoes are expensive! Cut a long story short, it turns out I have been living in 5 pairs of shoes this winter (6 if you count slippers) and it’s doable! Black boots – A winter essential in my eyes! Comfy, warm and can go with most things. Leggings, jeans, tights. You name it, you can probably wear it with boots. Navy blue ankle boots – If you are like me, and have a mild obsession for navy blue clothing, then a pair of navy blue boots is needed! I prefer boots, rather than shoes in this case, because again, they are much warmer. I happened to find a pair of boots easy to slip on and off, so these also double up as my emergency night time fire alarm drill shoes. Yes, you read that correctly. I even leave them by my door each night just in case! 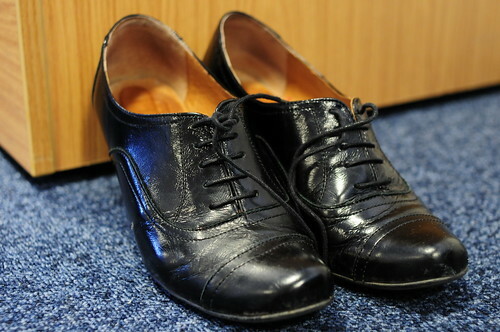 Black patent brogues – Out of action this week until the shoelaces I ordered from Amazon arrive. It’s worth having something a little smarter and a tad more delicate, especially if you need to dress formally or are wearing a dress/skirt. The patent shine adds a special something too. Trainers – Gym essential and good to have for those busy days when you are rushing around and need something sturdy on your feet. Need I say more? There we have it. You only need 5 pairs of shoes to survive. What’s even better is that you save on space too! Great if you like things tidy like me! P.S. They aren’t my boots in the photo. I am in need of shoe polish, so let’s just say none of my shoes are photo worthy at the minute!